This time of year, my husband is home for dinner every night. During football I don't cook four nights a week, during basketball, two. I love having him home, but I've definitely felt the need to expand my recipe box. We've also turned a major corner as far as trying to eat food that is a lot better for us, more organic veggies, less random bad for you things, etc. Ben LOVED this recipe, and I happened to make it on a night that was busy for my in-laws, so they both stopped by at different times to grab a piece. It made me so happy for everyone to get their nourishment from something delicious and healthy. We actually ate it the next night too (something we don't often do) and Ben took a large piece to work for the rest of the week. It was just an overall success... and a recipe that comes out on the cheaper side because it's a vegetarian dish. And gluten free! I feel like it would be really good for entertaining. 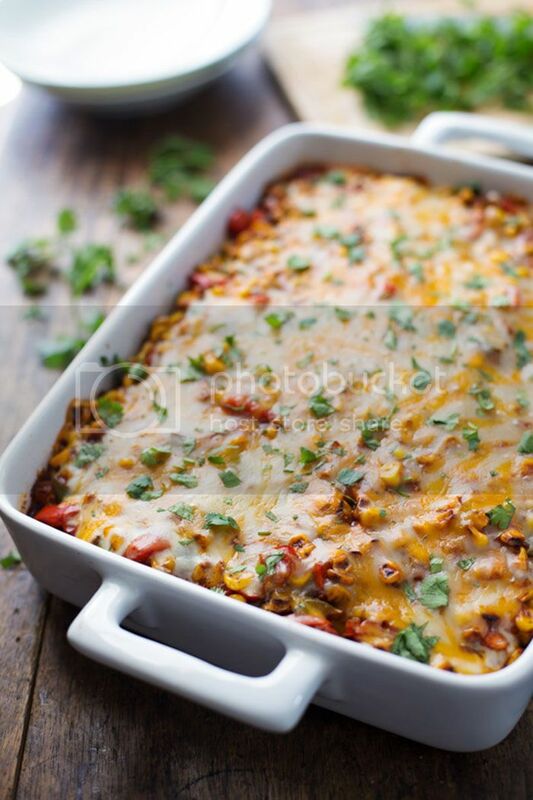 Okay, I'm done declaring my love for this Mexican Casserole. Roast the veggies: Dice the peppers and mince the onions. Heat a large nonstick skillet with NO oil over high heat. Add the onion and peppers, sprinkle with chili and cumin, and do not stir. This allows the peppers to roast and brown on the outside. After a few minutes, give the pan a shake or stir and let the peppers sit again for a few more minutes without stirring. Remove and set aside. Repeat the roasting process with the corn, sprinkling with chili and cumin, removing from the heat when browned and roasted on the outside. Sprinkle the roasted veggies with a little bit of salt and toss to coat. To make this completely gluten free, make your own enchilada sauce or look for a gluten free brand. I have heard that Old El Paso is GF. Yummy! Stephen is not a big fan of Mexican food but he loves casseroles. I'll give it s try! I just came across your blog and I love it! its so simple and pretty and clean and your posts and pictures are so great! I can't wait to follow along and I can't wait to try that recipe!! I'm always looking for something new to add to our recipe box!